This book feels like it picks up at the end of a horror film, the bloodstained heroine survives a terrible ordeal and we join her 10 years later when she’s coming to terms with the fact that she’ll have to spend the rest of her life as a ‘final girl’. 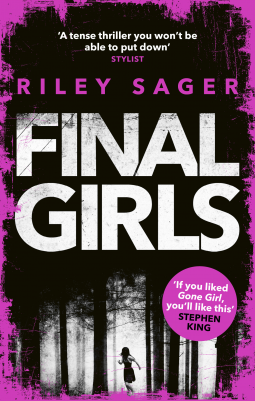 Final girls are doomed to become media fodder every time a similar event crops up and the target of weirdos and fetishists, while they try to recover from the trauma of their past. In this case, Quincy’s doing a pretty good job. She has an income, a strong relationship with her boyfriend Jeff and a future that doesn’t feature any more horror. The synopsis of this book tells you what’s going on, so no need for me to add any more here or I’ll spoil the fun. I will, however, say that it’s nothing like anything you’ve ever read before. What I enjoyed the most is how Sager has written very complex and developed characters – everyone has a good and a bad side in this book, they’re capable of anything and that’s what keeps the tension going until the very last page. Sager builds nail biting tension throughout this book, combining the art of the unreliable narrator and characters with everything to hide. I didn’t have a clue how this book was going to end right up until the final chapter and it was BRILLIANT. Quincy is very easy to connect to as a main character, she’s understandably a neurotic mess after everything that’s happened but she’s moving forward and trying to keep herself together. She’s not a perfect human being, she’s a little too reliant on Xanax and red wide, and she has a fiery temper but she’s doing the best with what she has. When Sam sweeps into town and forces her to dredge up the past, things start to get messy. The dynamic between the two characters is fascinating, it’s completely unhealthy from the very start but they’ve both survived the most unimaginable hell at the hands of other people and know that the other can understand them. There’s not a hell of a lot else I can say about this book really other than that I loved it and hope that this author has more books up her sleeve along the lines of this one! She’s come up with an entirely original concept and, as far as I’m concerned, written the story in the best way possible. If you’re a horror film, thriller or murder mystery aficionado: this book will rock your world. It’s the ultimate survivor’s story, which left me with that ‘you go girl!’ feeling at the end.